MADE TO DELIVER. CYBEX VR3 selectorized line of strength equipment delivers performance and results. The CYBEX brand is known globally for excellence in adapting fitness training to the human body; the VR3 collection is a tribute to that heritage. 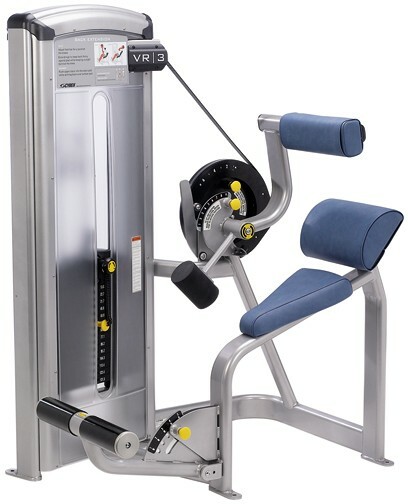 A group of machines that combines striking appearance with excellent performance, VR3 has been engineered to operate in a wide variety of environments - from the highly supervised to the self serve facility. CYBEX takes advantage of the latest in manufacturing techniques to build products to order in the USA. Facilities can choose from a wide range of colors and still have on-time delivery of the durable products CYBEX is known for. VR3 is the selectorized line that is built to last with engineering so sophisticated it makes strength training appear easy.